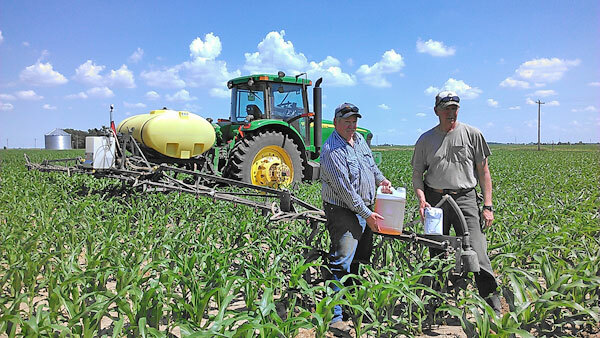 Since 2010, a handful of growers in the Nebraska On-Farm Research Network have researched the application of sugar to their corn, soybean, and sorghum crops. The primary goal was to determine any effect on yield. Some growers also looked at stalk strength and microbial communities in soil samples. Sugar application rates were based on looking at other successful growers such as Kip Cullers. Based on his program, a 3 lb/acre rate of granulated sugar (beet or cane sugar purchased from the local grocery store) was used in 10 gallons of water at 7-8 leaf (V7-8) corn or beginning pod (R3) stage soybean. Sometimes growers added glyphosate to the tank with sugar for a post-herbicide application when applied to corn and others did not. To simulate any effect from the water application or driving through the field, some growers also drove through the untreated check spraying water only; others did not. Table 1 shows Nebraska On-Farm Research Network results of sugar applied to corn and sorghum. In general there were no statistical yield differences with sugar application to corn or sorghum other than in the 2013 Clay County site where there were problems getting water through the field with gravity irrigation, particularly in one area where the sugar plots were located. Reduction in stalk rot was observed in all but the York County site in 2011. Combining all the site-years, there was a statistical location interaction; however, when looking at the treatments, there was no statistical yield difference between sugar application and the untreated check in corn. Significant site by treatment effect (Pr>F=0.0299). The treatment effect was not significant (Pr>F=0.4798). Letters (a, b) indicate statistical significance between treatment means at P=0.05 (P=0.10 in 2014). *Product recommended rate is 1 qt/ac Plen-T-Sweet. The high rate coupled with irrigation problems may have affected the Clay Co. site in 2013. Table 2 shows the Nebraska On-Farm Research Network results of sugar application to soybeans. Statistical yield increases with sugar application were observed in 2013 and 2014. When combining site-years, there was not a statistical difference based on location; however, the treatment effect of sugar application compared to the untreated check was statistically significant. There was no site by treatment effect (Pr>F=0.6726). The treatment effect is significant (Pr>F=<0.0001). Fungicide application to corn has been shown in some studies to help with stalk strength at harvest. In general, better stalk strength was found in corn treated with sugar than in the untreated check, based on the pinch test method used in our on-farm research plots. In the pinch test, 20 corn stalks are pinched by the thumb and first finger at the first internode above the soil a few weeks before harvest. Percent stalk rot is then determined from the number of stalks out of 20 that crush. Because of better corn stalk strength in many plots treated with sugar compared to the untreated check, some growers questioned if the stalk strength and yield results would be similar to that of a fungicide application to their crops. Tamra Jackson-Ziems, Nebraska Extension corn pathologist, was also asked to test this study in small plot research at UNL's South Central Ag Lab near Clay Center. The results from these studies can be seen in Tables 3-4. In the combined on-farm research site-year analysis (Table 3), there was no statistical yield difference between the sugar and Stratego YLD applications to corn but both were statistically higher yielding than the untreated check. There was also no statistical difference in stalk rot for any of the treatments at any of the on-farm research locations listed in Table 3.
Letters indicate statistical significance between treatment means at P=0.05 (P=0.10 in 2014). Research at the UNL South Central Ag Lab showed the sugar treatment yielded statistically lower than the untreated check and Headline AMP treatments in 2012. There were no statistical yield differences among treatments in 2013. There were also no statistical yield differences for percent lodging among treatments both years. DKC 64-83 Planted April 26, 2012, Harvested Sept. 26, 2012; 6 Reps; Treatments applied at R2. Check: 20 gallons of water only. P=0.05 according to Waller-Duncan K-ratio t Test. Means with the same letter are not significantly different. *Area Under Disease Progress Curve (AUDPC) for gray leaf spot (GLS), common rust (CR), and southern rust (SR) was calculated. The AUDPC calculation is commonly used to observe cumulative disease severity over the entire growing season rather than observing disease severity at one specific rating date. Disease severity data were used in a calculation utilizing disease severity on each rating date and the difference in the number of days between ratings dates in terms of Days After Planting (DAP). In general, the lower the AUDPC value, the lower the accumulated disease severity at the end of the season. The previous crop both years was soybeans. DeKalb corn hybrid DKC 64-83 has a rating of "good" (6 out of 9) for gray leaf spot (GLS), "very good" (4 out of 9) for common rust (CR), and "good" (5 out of 9) for southern rust (SR). NK corn hybrid N68B had a rating of "fair" (7 out of 9) for gray leaf spot (GLS) and was not rated for common rust (CR) and southern rust (SR). **Lodging was rated by using the push lodging test instead of the pinch test. This assessment was defined as the percentage of corn stalks lodged below the ear node or which did not return back to their standing position from 20 stalks (10 from each, rows one and four) pushed from the standing 12 o'clock position to a 2 o'clock (45 degree) position. A severe wind storm on August 1, 2013 may have impacted the results of the push lodging test that year. Table 5. Results from Clay County 2013 Sugar Application to Corn location where ear leaves and soil samples were collected to measure Total Carbon, Percent Nitrogen, Phospholipid Fatty Acid test, and Diversity Index between sugar treated and untreated check plots. To help explain increased stalk strength in sugar treated corn plots compared to the untreated check, a hypothesis was formed suggesting sugar application early in crop development (V7-8 leaf corn) may increase beneficial microbes in the soil and on the plant surface. While we did not directly test that hypothesis, ear leaves of plants within each plot were collected during tassel to determine total carbon and percent nitrogen at the Clay County Field in 2013. Soil samples were also taken at that time from each plot for phospholipid fatty acid tests (PLFA), a tool for estimating microbial biomass in the soil. (Read more about this microbe test.) There were no statistical differences between the untreated check and the sugar application for total carbon, percent nitrogen, PLFA, or diversity index. The application of sugar to corn, soybeans, and sorghum in Nebraska has not consistently shown statistically significant yield increases; however, combined site X year analysis from 2010-2014 did show a statistically significant yield increase for soybeans compared to the untreated check. Combined site X year analysis from 2012-2014 also found statistically significant yield increases for applications of sugar and Stratego YLD treatments compared to the untreated check in corn. Research did show corn stalk strength from sugar and fungicide applications compared to the untreated check did not statistically differ in field scale and small plot research. In research conducted at UNL's South Central Ag Lab near Clay Center, Area Under the Disease Progress Curve (AUDPC) for gray leaf spot, common rust, and southern rust did not statistically differ for sugar- or fungicide-treated plots in 2012 and 2013. Headline AMP had a statistically lower AUDPC compared to the untreated check for common rust in 2012, gray leaf spot in 2013, and southern rust in both years. The sugar application had a statistically lower AUDPC for southern rust in 2012 compared to the untreated check. While different sugar sources were used in the on-farm research studies, research outside of Nebraska did not find statistical differences in yield between different sources of sugar when compared to each other and an untreated check. Research outside of Nebraska showed increased beneficial insects in plots where sugar-water solutions were applied suggesting sugar application as a potential biological control tool. We did not collect data on insects in our studies. Sugar application to corn early in the season (V7-8) with potential benefit to stalk strength has yet to be explained. Recent research conducted on four-leaf stage rice1 showed greatly reduced disease when sugar was applied one day before pathogen inoculation of plants. That research suggested the sugar-induced plant defense mechanisms helped the plant overcome attack by plant pathogens, reducing disease. Additional research could look more specifically at sugar application and future disease onset to determine if sugar also induces plant defense responses in other crops. If it does, application of sugar could become another tool in the toolbox for farmers dealing with fungicide resistance to various pathogens. Also view research results outside of Nebraska on applying sugar to crops. We are grateful to the growers who conducted these sugar studies on their farms for several years so we could obtain these datasets! If you are interested in conducting this study on your farm this year, please view the following protocols and contact any of our Extension educators or specialists working in the Nebraska On-Farm Research Network. We also wish to thank Dr. Ray Ward, Ward Labs in Kearney for helping us with the microbe tests and providing them at reduced cost. 1Gomez-Ariza, J., Campo, S., Rufat, M., Estopa, M., Messeguer, J., San Segundo, B., and Coca, M. 2007. Sucrose-Mediated Priming of Plant Defense Responses and Broad-Spectrum Disease Resistance by Overexpression of the Maize Pathogenesis-Related PRms Protein in Rice Plants. Molecular Plant-Microbe Interactions 20(7):832-842.